Grow in the Word with Andrew through his Living Commentary, the most comprehensive accumulation of revelation the Lord has given Andrew over the last fifty years. 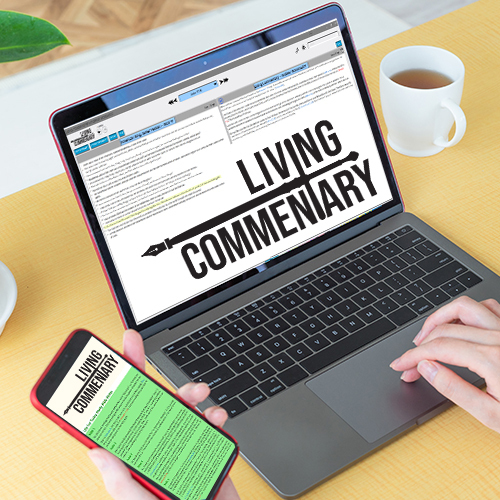 The Living Commentary is a Bible software program for Windows and Mac that includes four decades of Andrew Wommack's personal study notes on over 22,000 scriptures. This "living" commentary is continually expanded as Andrew's recent studies are added to the program. Andrew's Living Commentary makes in-depth Bible study easier than ever before. The program allows you to compare scriptures and notes simply by hovering over a reference and includes several Bible versions, additional commentaries, dictionaries, concordances, maps and other resources. The Living Commentary also includes all the notes from Andrew's Life for Today study Bibles, and an online version can be accessed via smart devices. Minimum System Requirements: Windows 7, 8, or 10; Mac OS X 10.12 or greater. (Currently not available for iPad, iPhone, Android or other mobile operating systems. Accessible on mobile smart devices via a web browser).